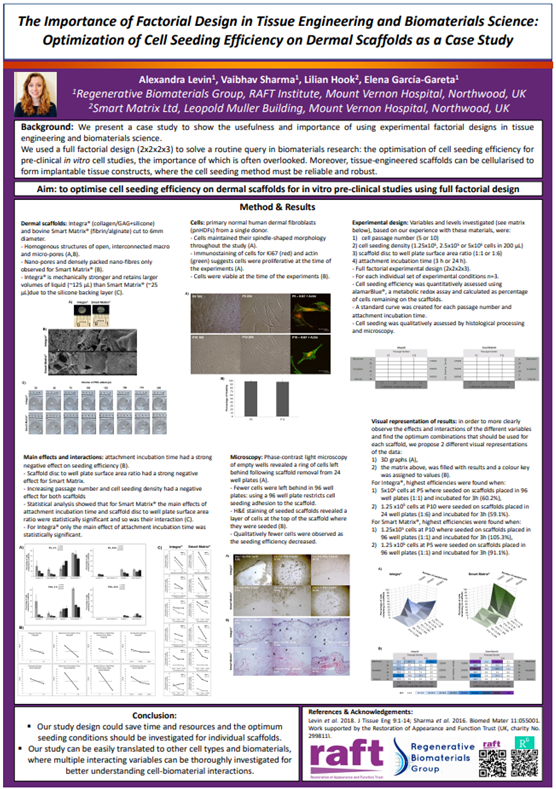 Although the importance of a research poster is completely lost on those without a science background – who can only picture what teenagers hang on bedroom walls – they are an important part of the research process. 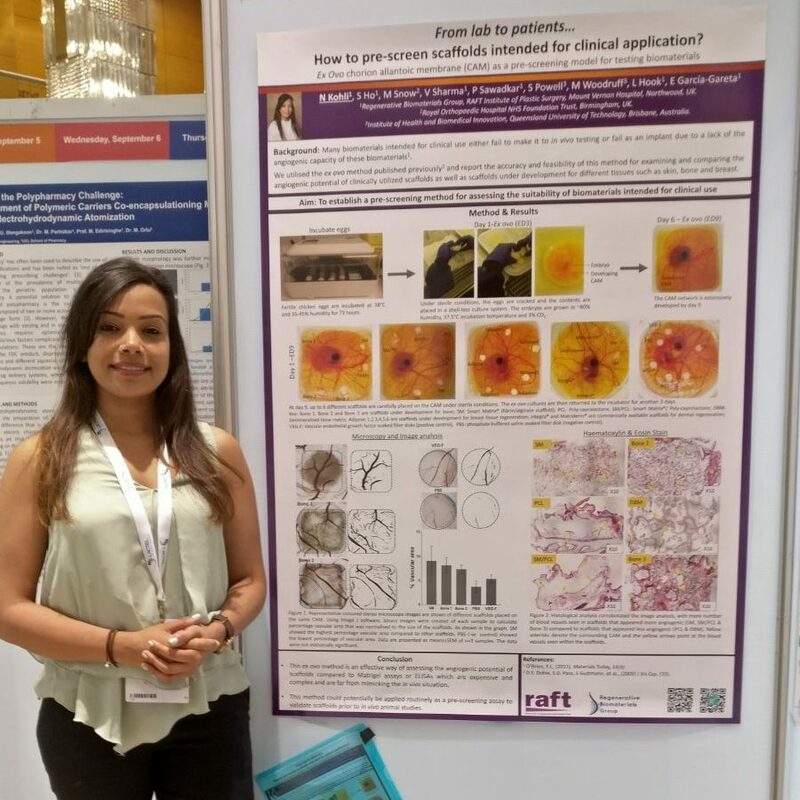 A poster session at a conference is a good opportunity for scientists to present themselves and their research in a favourable light, make contacts and get useful feedback. There is usually considerable competition during poster sessions for the audience’s time; presenters need to capture their attention and communicate their message quickly and succinctly. 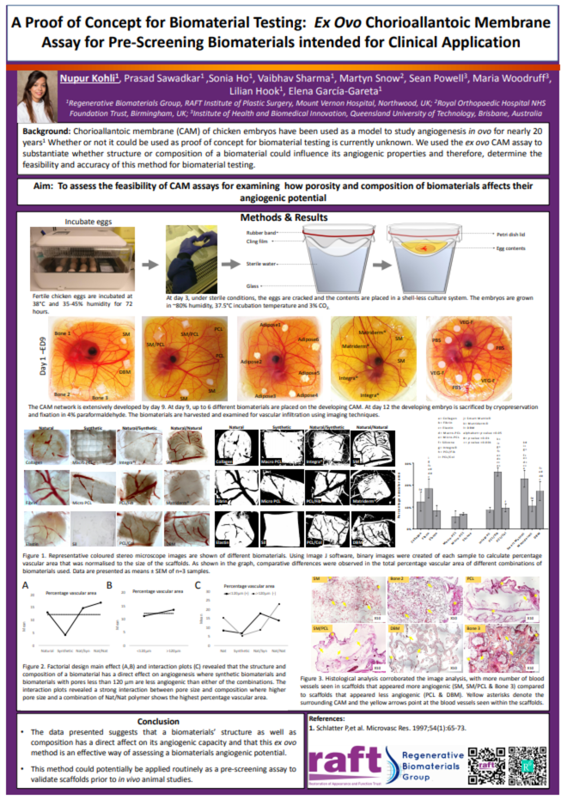 A successful poster presents a scientist’s work clearly and professionally, and it encourages the audience to stop and discuss the work. 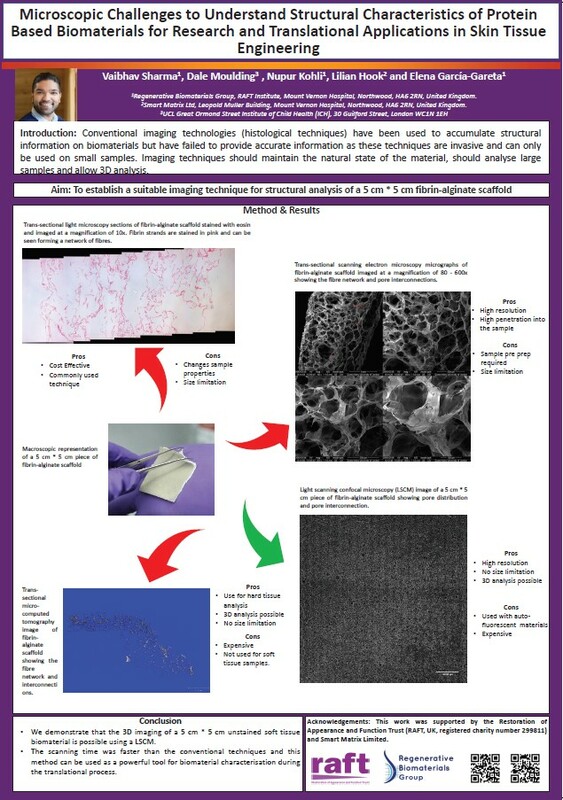 Aim: To establish a pre-screening method for assessing the suitability of biomaterials intended for clinical use. Aim: To functionalise clinically relevant metal surfaces with CaP apatite-like mineral deposits. 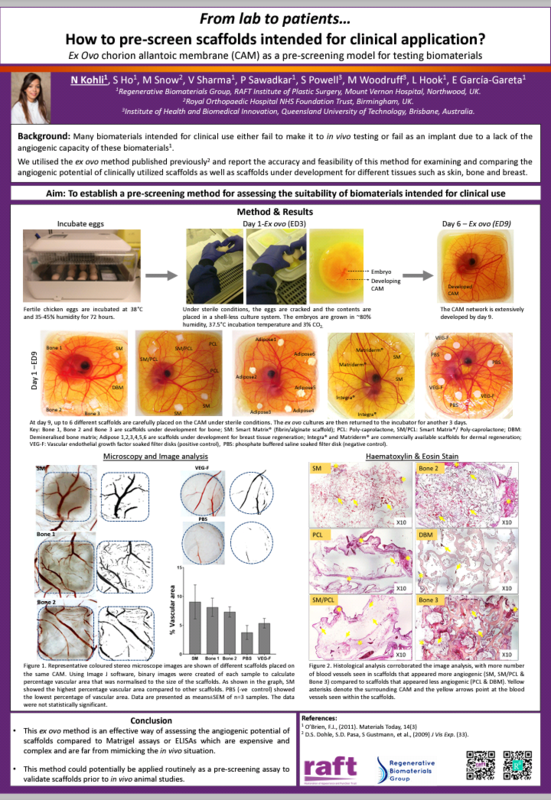 Aim: To generate primary normal human dermal fibroblasts with impaired migration using RGD peptides for in vitro models of aged wound healing. 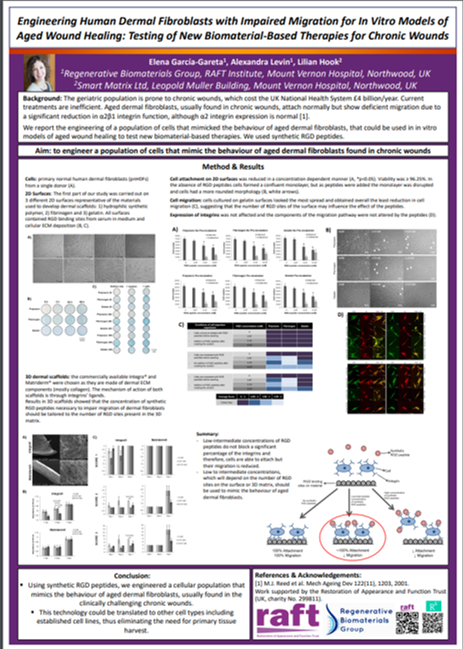 To investigate optimum conditions to improve cell seeding efficiency on dermal scaffolds for in vitro pre-clinical studies. We hypothesised that synergy of variable affects cell seeding efficiency. 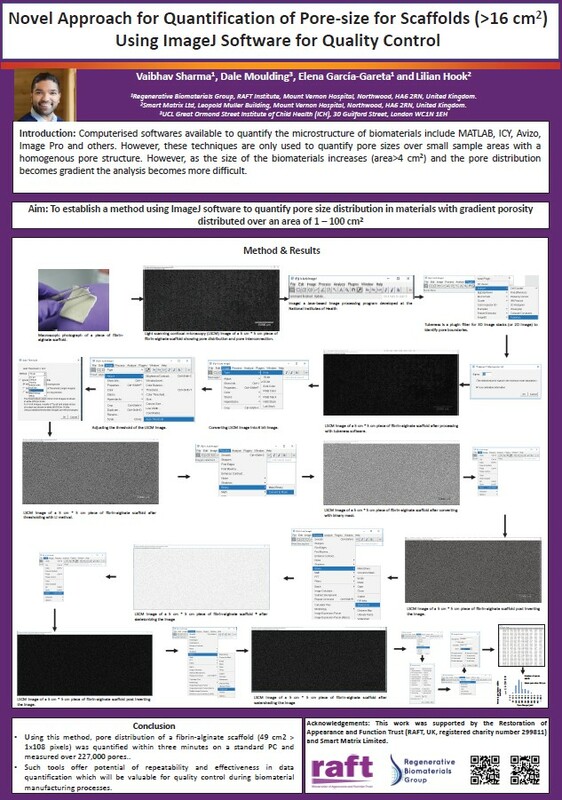 Aim: To characterise the viscoelastic, physical, and bio-degradable properties of the novel scaffold, Smart Matrix® and compare them to those of Integra®. Aim: To remove or significantly reduce the concentration of albumin present in human fibrinogen solutions using simple, classical biochemical techniques as an initial step in the manufacturing of human fibrin-based biomaterials. Ageing significantly affects wound healing with the geriatric population, prone to chronic wounds (diabetic, pressure and venous ulcers), which cost the UK National Health System £4 billion/year. Collagen is the base component for the majority of dermal scaffolds. Smart Matrix™ (SM) is a new fibrin based scaffold showing rapid integration and vascularisation in vivo. Wound healing involves both recruitment and differentiation of unspecialised cells and fibroblasts to the site of injury. This is regulated by cytokines and growth factors such as tumor necrosis factor-α (TNFα)(increased in acute and chronic wounds), transforming growth factor β (TGFβ) (increased in scar tissue), interleukin-8 (IL-8) & vascular endothelial growth factor (VEGF) (initiate vascular growth in response to injury). Human placenta is a readily available, highly vascular tissue with abundant sources of mesenchymal stem cells (MSC). 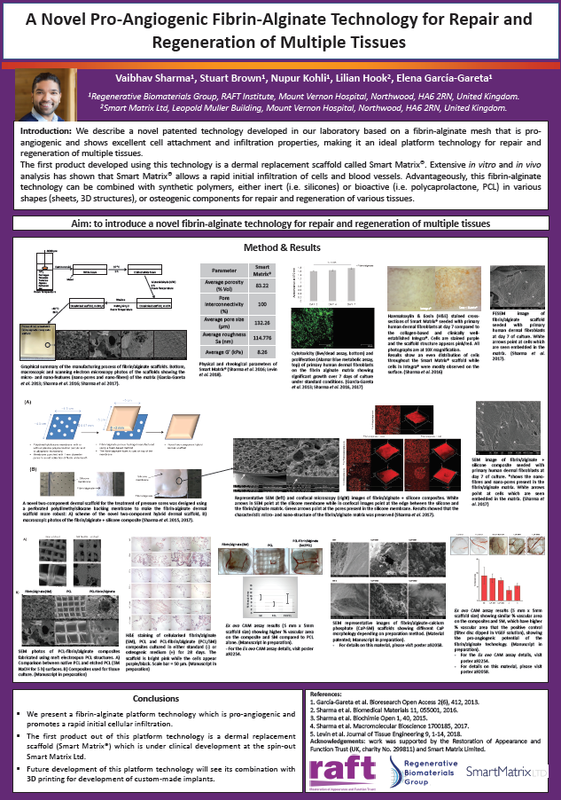 HP-MSCs can be used in conjunction with biomaterials to study mechanisms of tissue repair, and have potential for tissue regeneration. A major concern related to large area skin wounds is loss of barrier function and current standard treatments (autologous split thickness grafts) have been associated with complications of scarring and lack of availability of donor sites. Silicone (Si) surfaces can be made more biocompatible by introducing specific functional groups such as acrylic (AcA), allylamine, (AlA) through a relatively simple one-step coating process called plasma polymerization. This works aims to develop a composite scaffold with biological properties of fibrin and improved robust silicone backing. There is an increased need for biomaterials with stronger mechanical properties and better cell infiltration rates. 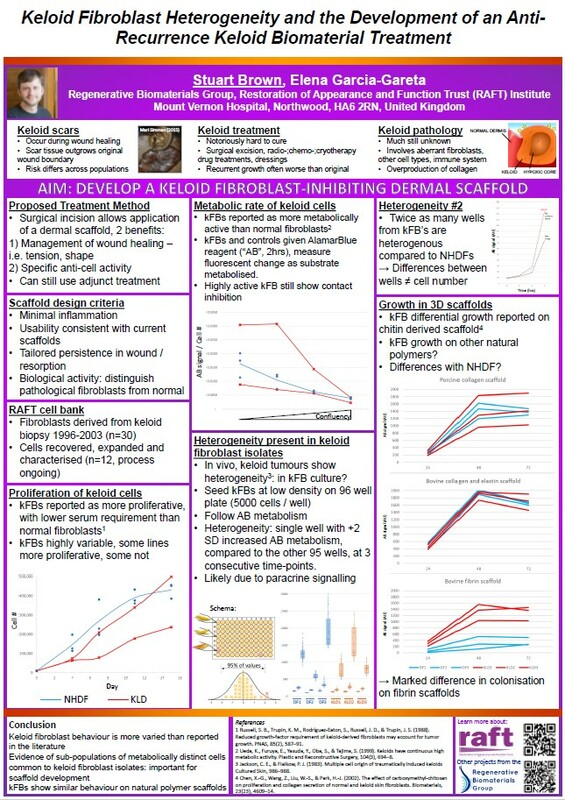 The aim of this study was to develop a novel in vitro model of 3D cell ingress into dermal scaffolds, to predict in vivo outcome of a new a new dermal scaffold under development, SM, and of the commercially available I and MD, considered reference products. The use of adipose-derived stem cells (ASCs) as an autologous and self-replenishing source of tissue provides much promise in reconstructive surgery. This study led by UCL Phd student/RAFT Researcher Vaibhav Sharma aimed to characterize and quantify target protein binding to derivitised Si surfaces and investigated the binding strength between the protein and the polymer. A free-radical theory of cancer requires that susceptible individuals lack, or have inadequate, antioxidants to detoxify free radicals, and diminished capacity to cope with metabolic oxidative damage, ultraviolet (UV) irradiation and radicals in cigarette smoke. An unexpected finding that a single low dose of insulin applied during a specific time window during wound healing has the potential to significantly reduce the formation of scar tissue whilst allowing successful healing to take place. In this study we used continuous wave ESR, with and without the spin trap DMPO, to study the effects of UVA-irradiation on free-radical reactions in pigmented and non-pigmented melanoma cells. A Summary of: Immunocytochemical Analysis of UVA Induced Free Radical Mechanisms of DNA Damage in Pre Fed and Non Pre Fed (media supplemented) SK23 Melanoma Cells. Ascorbate (Vitamin C) accelerates hydrogen-peroxide induced cell death in melanoma cells: vitamin C modulates the immune system? Here we investigated the effects of ascorbate on H2O2- induced melanoma cell death in a system where metal-ions are chelated, and using ascorbate and dehydroascorbate to raise intracellular but not extracelluar ascorbate concentrations. The project is linked to a programme of work relating to the prevention of skin cancer caused by UV wavelengths from sunlight. The biological effect of UVA on the skin is not fully understood but it is known to cause free radical production in the skin, which might cause DNA damage. It is increasingly accepted that UVA has a role in skin carcinogenesis. UVA induces mutagenic lesions in human skin cells, and a higher proportion of UVA than UVB signature mutations have been identified in human squamous carcinomas consistent with the greater penetration of UVA compared to UVB. The UV spectrum is classically divided into 3 regions: UVA, UVB and UVC. In terms of solar radiation the UVC part is of little relevance on earth. UVB has always been regarded as the main culprit in causing neoplastic changes in the skin but recent evidence suggests that UVA is similarly malign.